Narcissus never discovered that he was only looking at a reflection. He tried to clasp and kiss it, but naturally was unable to do so. Frustrated and tormented by not being able to possess the object of his desire, he grieved and grieved. When mourners came for him, even his body had disappeared. All that was left of him was a flower next to the pool. This is the first recorded reaction to seeing one’s own reflection – a pretty depressing story, to say the least. But now let’s fast forward a few millennia and shift our attention away from the cradle of western civilization to a distant outpost of the late l9th Century British Empire. For it was in Australia that a historic man-mirror encounter of quite a different sort was taking place. How did it compare with Narcissus’ sad tale? Alexander eventually left his mirror and his homeland and moved to England. No doubt some he encountered there also thought him a bit strange – in a harmless sort of way of course. Others saw genius in the man and attached great value to his discoveries. They read his books, gazed intently into their own mirrors, and gladly paid good money for lessons in his Technique. 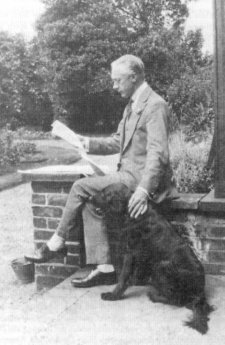 A few of them devoted their lives to furthering his work. This pattern continues today, almost sixty years after Alexander’s death. Narcissus became world famous. His story is perhaps the best known of all the tales of ancient Greek mythology and his name has become synonymous with self-love and self-centeredness. Alexander, on the other hand, remains comparatively unknown, although his name too has crept into the vocabulary of his followers. One early American disciple suggested that the President and all members of Congress ought to be fully and completely “Alexanderized” before they assumed their duties. Students of his method sometimes speak of “doing their Alexander” and at time accuse each other of being stiff “Alexandroids”. Alexander teachers and students can occasionally be accused of narcissism – when our legitimate Alexandrian emphasis on paying attention to ourselves slips over into obsessive self-interest. But for for the most part we continue to use mirrors, and other tools for self-observation, in a discerning and reasoned manner. This is something Narcissus was simply not able to do. He was overcome with self-love, and in no condition to bring his critical faculties to bear on his predicament. “That poor chap was simply not in communication with his reasoning,” Alexander might well have declared. 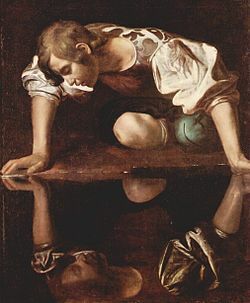 Unlike Narcissus, who wanted to merge with his reflection, Alexander used his mirror as a means of distancing himself from his faulty sensory awareness. In his own “creation story” – Chapter I of Use of the Self – Alexander systematically brings his mirror into play at each step of his quest. While Narcissus lost his human form and was transformed into a flower, Alexander used his reflection to gain accurate information about himself in order to fulfill his human potential. Indeed the mirror proved to be his principle tool for learning the truth about his behavior, and about the effectiveness of the attempts to make useful changes in that behavior. As far as we know, Alexander was the very first person in history to use a mirror in that way. He forever changed the relationship between man and mirror and that in itself is worth reflecting upon. you have wonderfully explained the relationship between human and mirror. Thanks Robert — Totally agree! my thoughts on Alexander and the mirror here. David, You might want to check out the Delsarte/Alexander conversation now taking place on FB. Thanks Robert — I had never heard of Delsarte. Also interesting that mirrors have only been mass produced for a little less than two centuries. What has replaced “Alexander’s” mirror is the Alexander teacher’s hands and guidance. Another human being. Being that mirror for my students, I am acutely aware of my own reflection in others. I find it not only in my students of course but also in my friends and family. Where I encounter my reflection in a most powerful way however is in Tango dancing. I have been dancing for 10 years, never knowing before hand whom I will encounter on my evening’s night out. Each embrace reveals an aspect of myself. Sometimes I melt into it so as to dissolve like Narcissus. I dissolve into bliss rather than in sorrow. Sometimes I turn into a most acutely defined, precise, “high-pitched” dancer, picking up and following the smallest twitch from my partner. The contact with my partner reveals any holding pattern I might have and I release. It reveals any moment my attention drifts away. Then it either turns into a miss-step (where there is doubt) or an opportunity (where there is trust). It offers a lovely balance between my leading skills as an AT teacher and my following skills as an AT (as for Argentine Tango) dancer. Delightful post, Robert. Thank you! Glad you like it Jennifer. That could well be the case Sara.